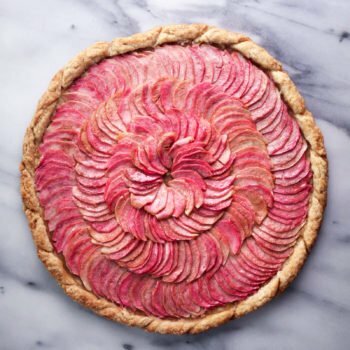 This apple galette is simple to make and makes a pretty presentation! Gluten free or vegan variation below! Make the dough first. If using store-bought pie crust, continue to the directions below. Place dry ingredients—flour, sugar, & salt, into a large mixing bowl. Use a pastry blender to cut shortening (or butter) into the flour, until well incorporated and no large pieces remain; mixture should be crumbly. Mix in egg (only if making the gf version) and then add water, a tablespoon at a time, until the dough comes together. It should feel like soft play dough. If it's too crumbly, just add a little more water. Flatten dough into a round disk shape, cover in plastic wrap, and refrigerate while you prepare the apples. Peel, core, and thinly slice your apples. The precise amount will depend on how big your apples are and what kind of pattern you want to make. I used about 7 small apples. I quartered them and used a mandolin to get even slices, but a good knife will do. Please be very careful not to cut your fingers either way! In a small bowl, mix together melted butter, maple syrup, and cinnamon. Set aside. Preheat oven to 400ºF. Take your dough out of the refrigerator 10 minutes before you plan to roll it out. Place dough on a piece of parchment paper and roll out into a large circle. Arrange apple slices over the top of the dough, leaving about a 1–2 inch border. Once you've placed all of your apples, drizzle butter mixture evenly across the top. Use a pastry brush, if necessary to spread it evenly over the apples. Roll edges up and decorate as desired. Place galette and parchment onto a large baking sheet and into the preheated oven. Bake galette for 30–40 minutes, until apples are tender and crust is golden brown. Best served right away. Makes about 10–12 servings. If using the hibiscus glaze from this recipe, brush it onto the apples after the galette comes out of the oven, then serve. *I like golden delicious, honeycrisp, pink lady, gala, or granny smith. **Egg helps hold gf dough together better. Can omit and use extra water but dough will be more crumbly.